Gold ended Friday’s session down $2.41, to settle at $1255.37 an ounce as investors continued to cash in recent gains after the market failed to breach the $1267.50 resistance level. Gold prices which slumped to a two-week low of $1225.39 earlier in the week got a boost from the Fed’s announcement and ended traded as high as $1270.87. Friday’s data from the Commodity Futures Trading Commission (CFTC) showed that speculative traders on the Chicago Mercantile Exchange reduced their net-long positions in gold to 169512 contracts, from 174810 a week earlier. Speaking after the central bank kept interest rates unchanged and signaled fewer rate hikes in coming months, Federal Reserve Chair Janet Yellen said “Most Committee participants now expect that achieving economic outcomes similar to those anticipated in December will likely require a somewhat lower path for policy interest rates than foreseen at that time.” For the year, gold has added more than 18%, with turmoil in the wider financial markets fuelling interest in the metal as a shelter while reducing the likelihood of four rate hikes this year by the Federal Reserve. In other words, the U.S. central bank pronouncing it cut its expectations for rate hikes this year to two is not so surprising – and somewhat already priced in. From a technical perspective, the market has to either anchor somewhere above 1280 or fall through 1225 before we can see some action. Although trading beyond the Ichimoku clouds on both the weekly and daily time frames suggests the medium-term outlook is bullish, diminishing momentum is certainly something to watch – especially when there is a divergence between RSI and price action on the daily chart. To put it shortly, as long as the resistance at around 1280 is not surpassed, the risk of a retreat to 1225 remains high. 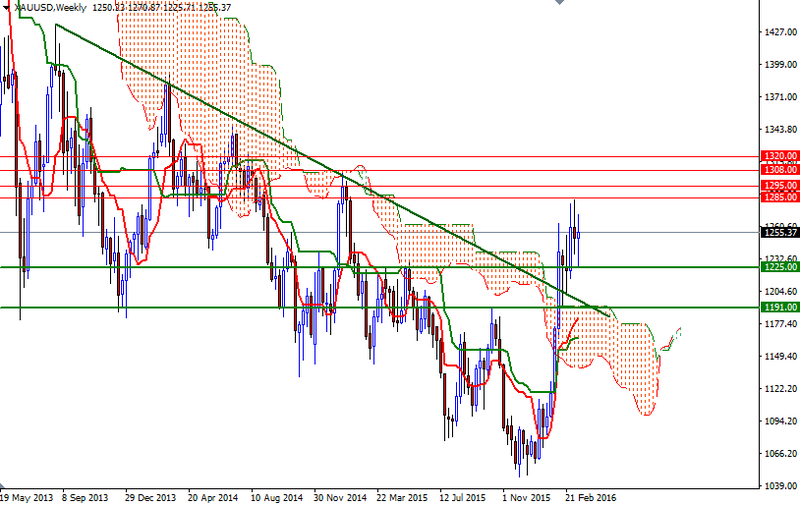 If XAU/USD breaks this support, then look for further downside with 1213 & 1205 as targets. Breaking through the 1280 level convincingly, on the other hand, would be an encouraging sign and open a path to the 2015 high of 1308. On its way up, expect to see resistance at 1295.